Just three hours ago, I had no intention of writing a blog post about the meaning of Occupy one year later. It certainly doesn’t mean that I don’t empathize with the movement; in fact, I was involved with local activities and even took my ‘Critical Media’ students to a sit-in with protesters so that they could gain insight that wasn’t filtered by the corporate media. But, it has been an exhausting week. Driving home after treating myself to a much-needed massage, I was daydreaming of an evening filled with pop culture magazines, chocolate and a relaxing bath. And then I met a man named Dwayne. Right at the intersection, before I got whisked off into the highway with other tired, irritated drivers making their way home during the height of rush hour, I was stopped at a red light for about three minutes. When I turned my head, I saw him at the intersection. He was holding a sign, with an orange vest on and I immediately felt a mixture of empathy and guilt. Empathy because of his situation, and guilt because I was in no position to help at the moment, trapped in my car in the middle of a highway, with no money of my own to give. And then, he smiled at me, and pointed to my long dangling earrings that were made of seeds from Brazil, tinged in a vibrant shade of orange (when I do fall colors, I do fall colors). He gave me a thumbs-up, and I felt a rush of disbelief overcome me. Here was this man, clearly struggling, trying to remain visible to a stream of people in moving vehicles, many of whom were probably pretending that he was not there, noticing something about me and wanting to make a connection. I was immediately grateful. I rolled down the window, and we talked, for two short minutes. His name was Dwayne, and he had been homeless for the last six months. He was looking for work, he told me, but not having a driver’s license made it difficult to get to job interviews. He then acknowledged that “everyone’s struggling, so no one is really able to give me much money” and that this month in particular had been the hardest for him. He asked me for my name, and I told him, in the midst of honking cars that indicated the light had turned from red to green. When I was forced to drive away, he shouted ‘God Bless’ and blew me a kiss. I thought of Dwayne the entire drive home, while standing in the checkout line at Food Lion, and as I sat on my futon at home, reflecting on our conversation and his comments about shared struggle. And it was then that I suddenly felt inspired to write about Occupy. When Occupy Wall Street erupted last September, it was one of the most exciting protest movements my generation had witnessed since the WTO protests in 1999. Building momentum from both the Arab Spring and the public frustration over the debt ceiling crisis in the summer of 2011, at the heart of the seemingly disparate movement were two main points of critique: that the distribution of wealth and opportunity in our culture was inequitable, and that the media system, controlled mainly by the ‘big six’ corporations, contributed to that status quo. And not surprisingly, the media lived up to its reputation as an institution that never disappoints in its marginalization of activist causes. Media watchdog groups like Free Press and Fairness and Accuracy in Reporting published stories on how Occupy was denigrated as a ‘hippie movement’ that didn’t have any idea what they wanted. Instead of interviewing the people who were involved in the movement, the media chose to rely on a stream of ‘experts’ and scholars to speak on behalf of the protesters, who were labeled in different media outlets as ‘crackheads’ (Bill O’Reilly for Fox, 10/14/11), ‘boring’ (Bill Keller, former executive editor for the New York Times, 10/14/11), ‘indignant indolents’ (Charles Krauthammer, The Washington Post, 10/17/11) and ‘Milquetoast Radicals’ (David Brooks, The New York Times, 10/11/11). And in a way, it makes sense. Mainstream news organizations are often reticent to report favorably on anti-corporate movements because they are themselves, owned by corporations. It creates a conflict of interest. Take Erin Burnett, a CNN reporter who was lambasted for her derogatory remarks towards the protesters. Guess where she worked before her tenure at CNN? 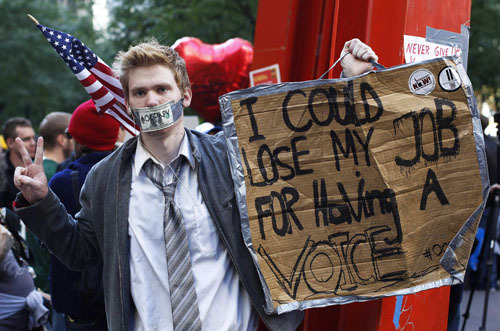 Goldman Sachs and Citigroup—the same financial companies that profited from the bailouts the Occupiers were protesting! To be fair, the media did start to portray the movement more evenly, as public opinion revealed a majority who were sympathetic to the Occupy cause. 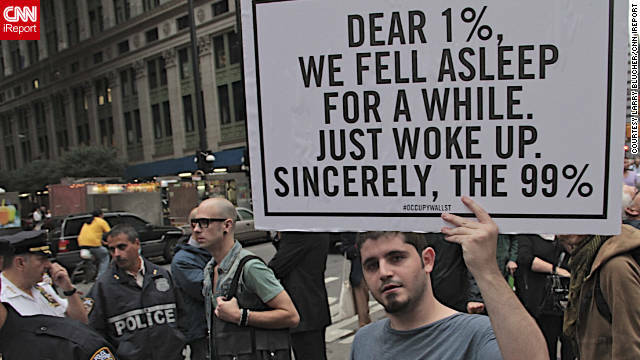 Even then though, the political media’s attempts to frame politics in a bipartisan manner often resulted in Occupy being labeled as a counterweight to the Tea Party, which conflicted with the anti-establishment message of a movement that freely critiqued Obama as much as it did the banks. 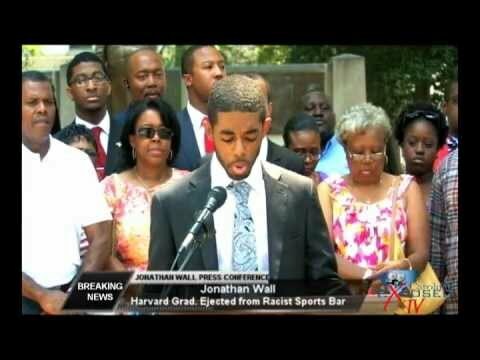 Jonathan Wall releases his statement on how a sports bar in Raleigh kicked him out for no reason. Now, celebrating its one-year anniversary, Occupy finds itself again denigrated by a media establishment that never really understood it. FAIR published a story on the different news outlets that proclaimed the Occupy Movement to be a failure and a fad. While there is some truth to the claim that Occupy was not able to create legislative and regulative change in the banking system (more likely due to the barriers in our political climate than any real issues within the movement itself), it succeeded in other important ways. Most notably, it helped to change the national conversation on wealth and inequality, creating the Twitter meme of #occupy and spurring occupy movements across the country that responded to local needs and issues. One local example I can personally cite was the ‘Occupy Downtown Sports Bars’ in Raleigh which was organized after a black Harvard graduate student got kicked out of a downtown bar for no apparent reason. 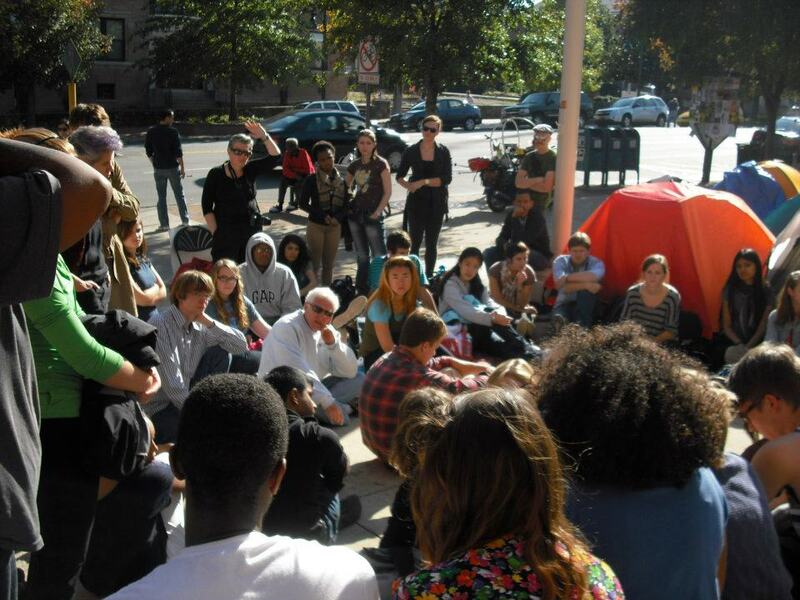 My students attend a local Occupy sit-in. And since when do protests have to achieve everything they hope to accomplish in a span of one year? If the Occupy movement hoped to deliver a marked critique of inequality, and call for a government that represents the needs of citizens instead of the big banks or corporations, then I would argue that they did a pretty decent job in 12 short months. They centered this question of economic inequality in national discourse for the first time since the 1960s, were involved in movements to protect citizens from evictions and foreclosures, pressured President Obama to ease the loan burden, if marginally, to current recipients and focused the attention on police brutality towards marginalized communities. They bravely critiqued the corporatization of society, including that of the mainstream media, and encouraged people to become active citizens by seeking out alternative sources of information and media. As an instructor of cultural and media criticism always trying to instill the importance of societal and political engagement, I couldn’t have asked for better inspiration for my students. So yes, one year later, a man named Dwayne is still homeless, and many people, as he himself so compassionately put it, are struggling. But that doesn’t mean that this revolution has failed. It has started a conversation about shifting the national paradigm to one of connection, to an inclusive society, to one that focuses on the needs of the people, to the 99%. It was about creating a world that works for everyone, including the 1%, who are also implicated in our society’s loss of community and intimacy. Occupy reinforced my belief that the worst crimes committed are the ones that happen when we don’t ask questions. After decades of apathy that helped to create our current economic and cultural crisis, we can no longer stand to look the other way. So here I am writing at 2 a.m., wishing that I could forget about Dwayne and lose myself in the mindless world of celebrity magazines, but knowing that I can’t, because the conversation must go on.